On October 19, 2018, Energy Transfer Partners and Energy Transfer Equity became one partnership, known simply as Energy Transfer (NYSE: ET). Simplifying our overall structure through Energy Transfer Equity’s acquisition of Energy Transfer Partners streamlines our organizational structure and improves transparency for our investors. It also provides the new Energy Transfer an improved cost of capital to more easily fund robust organic growth projects and to execute strategic M&A transactions. 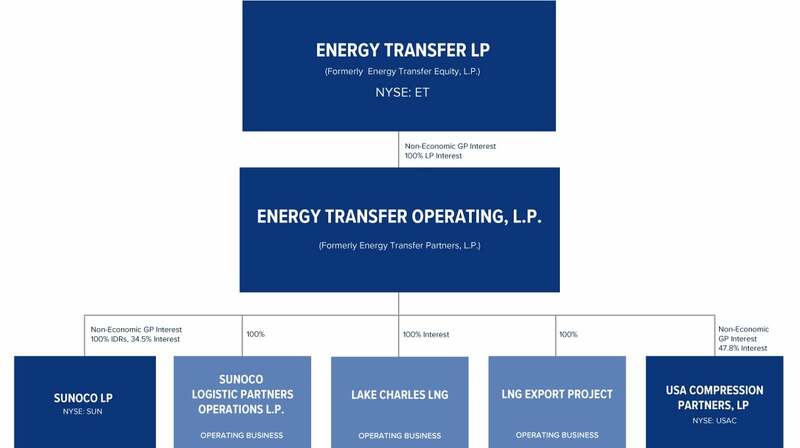 Today, there are three publicly traded partnerships in the Energy Transfer Family. (NYSE: ET) owns and operates one of the largest and most diversified portfolios of energy assets in the United States, with a strategic footprint in all of the major domestic production basins. ET is a publicly traded limited partnership with core operations that include complementary natural gas midstream, intrastate and interstate transportation and storage assets; crude oil, natural gas liquids (NGL) and refined product transportation and terminalling assets; NGL fractionation; and various acquisition and marketing assets. ET also owns Lake Charles LNG Company. (NYSE: SUN) is a master limited partnership that distributes motor fuel to approximately 10,000 convenience stores, independent dealers, commercial customers and distributors located in more than 30 states. SUN’s general partner is owned by Energy Transfer Operating, L.P., a subsidiary of Energy Transfer LP (NYSE: ET). For more information, visit Sunoco LP. (NYSE: USAC) is a growth-oriented Delaware limited partnership that is one of the nation’s largest independent providers of compression services in terms of total compression fleet horsepower. The Partnership partners with a broad customer base composed of producers, processors, gatherers and transporters of natural gas and crude oil. The Partnership focuses on providing compression services to infrastructure applications primarily in high-volume gathering systems, processing facilities and transportation applications. More information is available at USA Compression.